Sixth Ave. to Lawrence St. 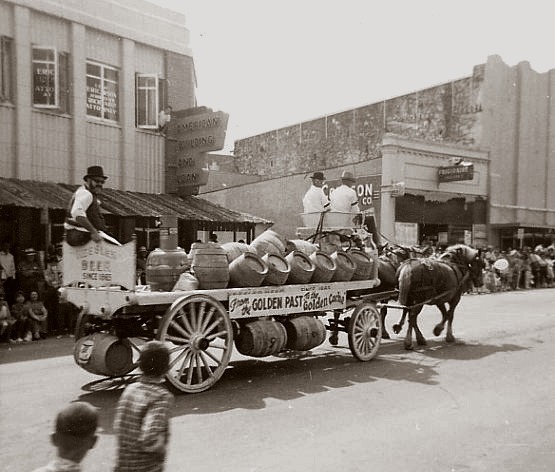 The Safeway market, seen here on the left in the Harmony Hall building, would soon move to the NE corner of Placer and Fuller; the Ben Franklin variety store would subsequently occupy this space. Harmony Hall (upstairs, with entrance on Jackson St.) had a maple dance floor, and was not only used for social events such as concerts and dances, but also as a roller rink. The hall was also known at various times as the New Winter Garden and the Oriental Ballroom. From 1932 to 1958, it was the home of the Central Bowling Alley. 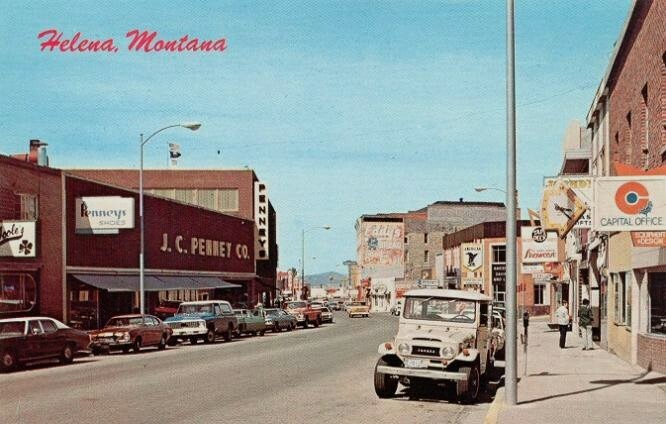 The downstairs (Main St. level) was for many years home to the Montana Meat Co. 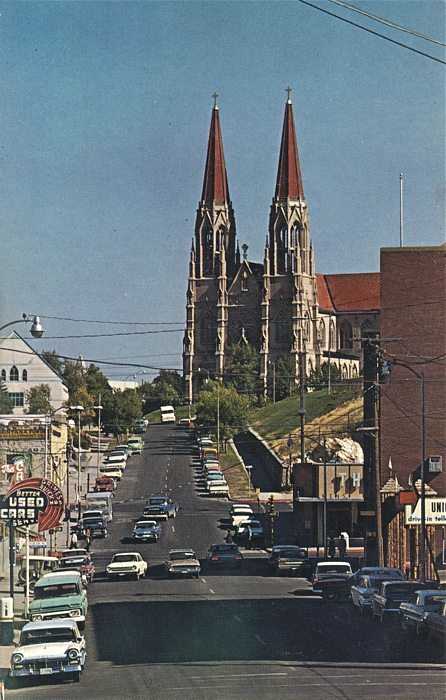 The building was demolished in 1970. 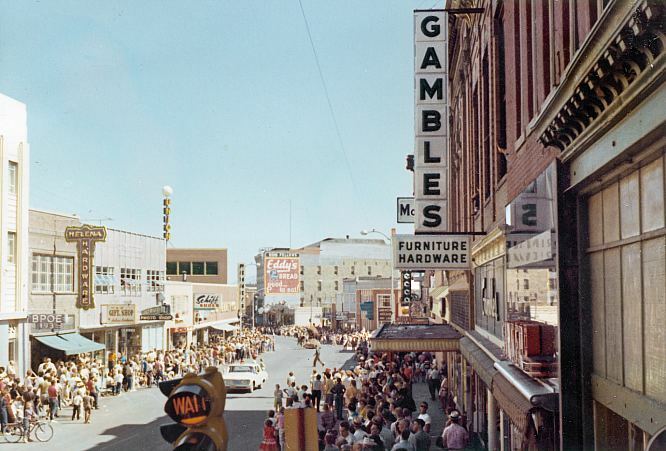 Also seen on the left are Gamble's, Singer Sewing Machines (opened in 1947), and Parchen Drug. On the right are the First National Bank, the J. C. Penney Co., and - in the Power Building - Goldberg's Furriers. Much more detail is available in the "big views". 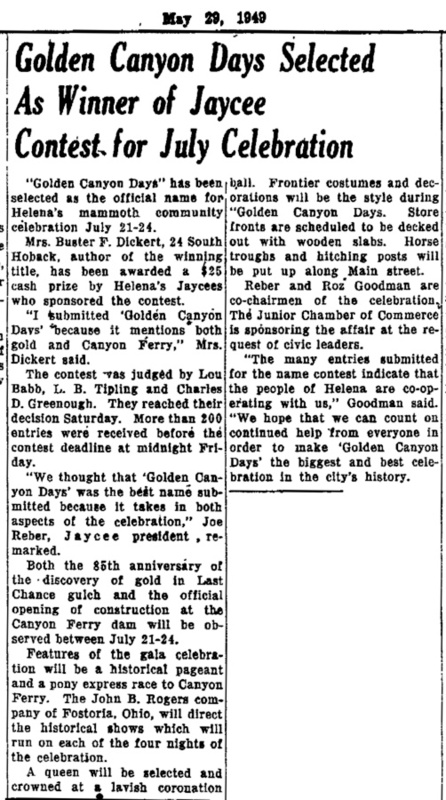 "Golden Canyon Days", held July 21-24 1949, celebrated the 85th anniversary of the discovery of gold in Last Chance Gulch, and the start of construction on the new Canyon Ferry dam. The unfortunate fellow portrayed with the noose around his neck looks like either a preacher or a lawyer. 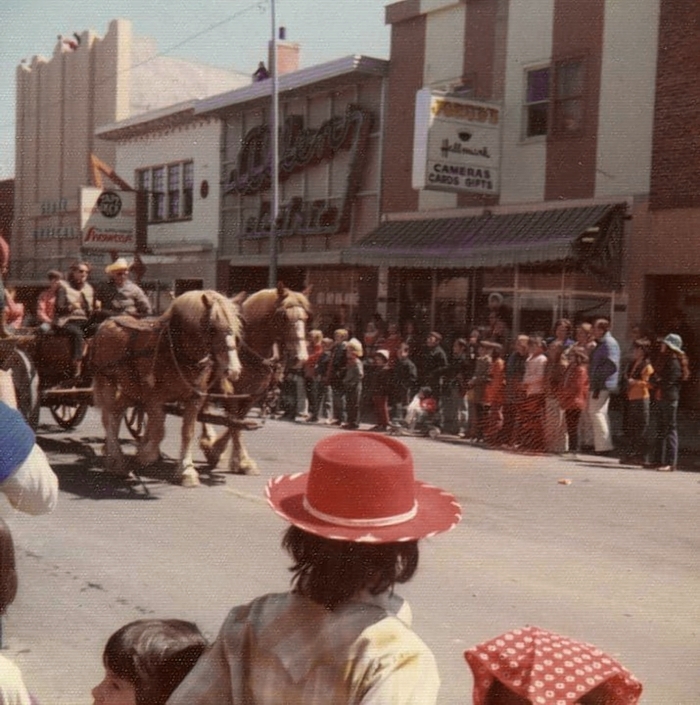 On the right is the Vigilante Theatre (formerly the Rio). 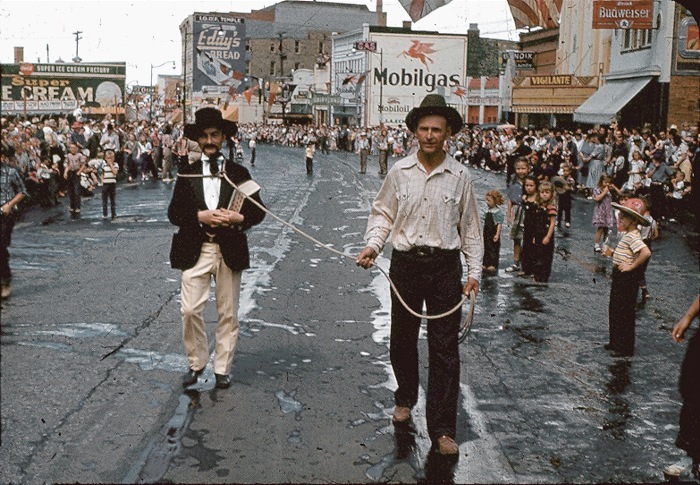 Farther north on the right-hand side of Main are the Mobilgas station at Main and Seventh (replaced by a new office building in 1956), Dairyland (ice cream and other goodies), Globe Clothing, and the tall Iron Front Building, which is still standing. 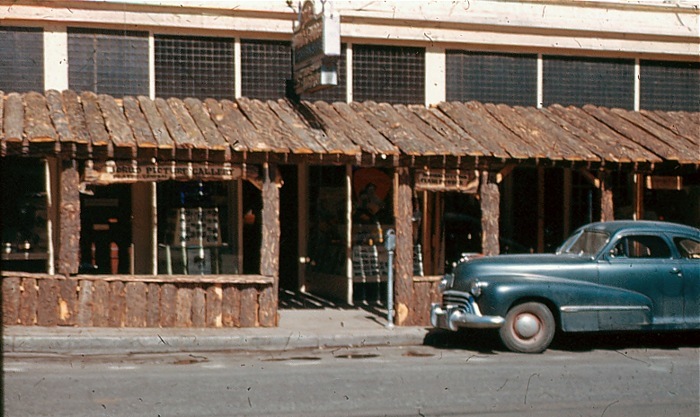 The Super Ice Cream store on the left was gutted by fire in January of 1951, and subsequently demolished. 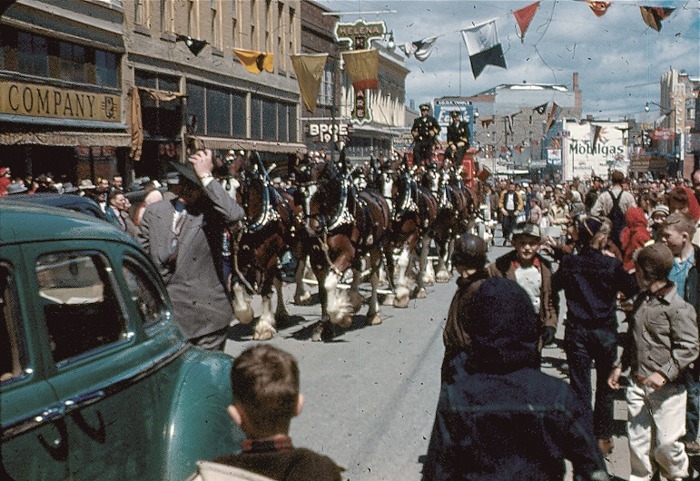 The Anheuser-Busch clydesdales, May 1950. Visible on the left is part of the Vigilante (formerly Rio) Theatre marquee. 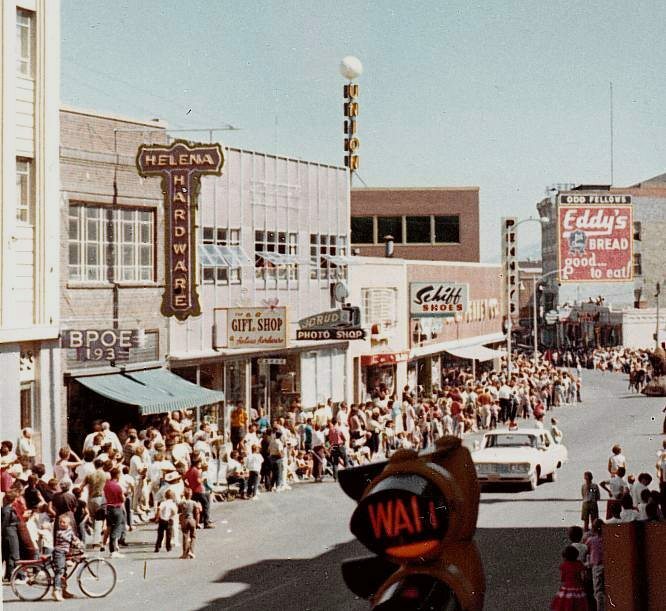 The building next to the Rio, 333 North Main, housed the Vigilante Bar when this photo was taken. In 1952, the apartment above the bar would be the scene of a murder-suicide. Click on the photo for the story (new window). CLICK HERE FOR AN EVEN BIGGER VIEW! On the left are the Mecca Cafe and Scott's Toys. 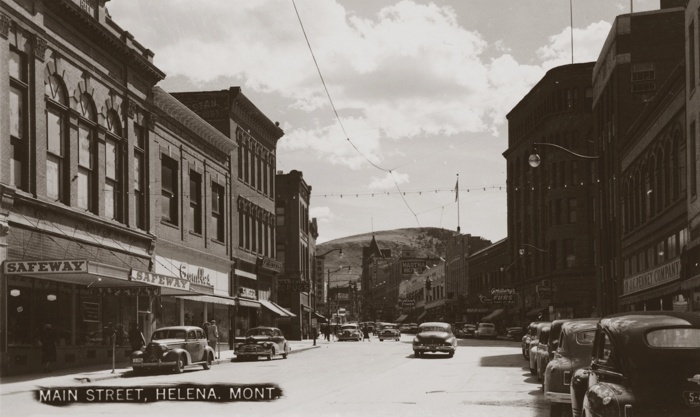 On the right we see Helena Hardware, the Elks Lodge (upstairs), Jorud Photo Shop, Palace Clothing, and the Silver Spur Lounge (which later became O'Toole's). 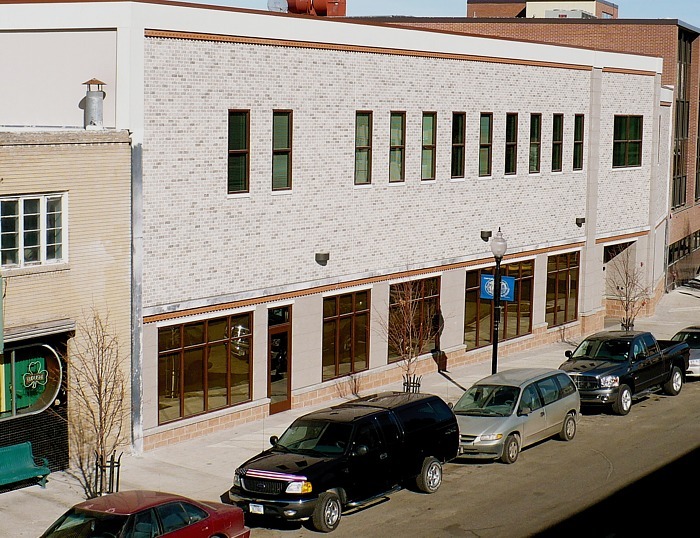 With restrained yet handsome brick and stone work, the Donovan building fits in well on Last Chance Gulch. 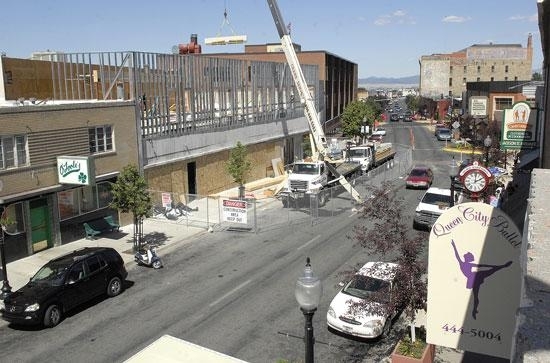 The design is by Crossman-Whitney-Griffin Architects of Helena. 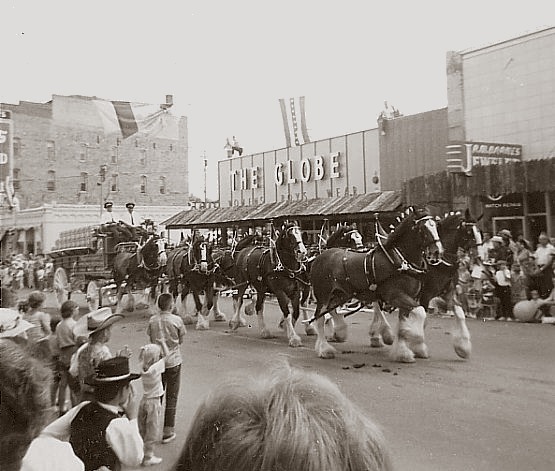 Note the rough pine-bark façades on The Globe Clothing Co. and Barnes Jewelry. 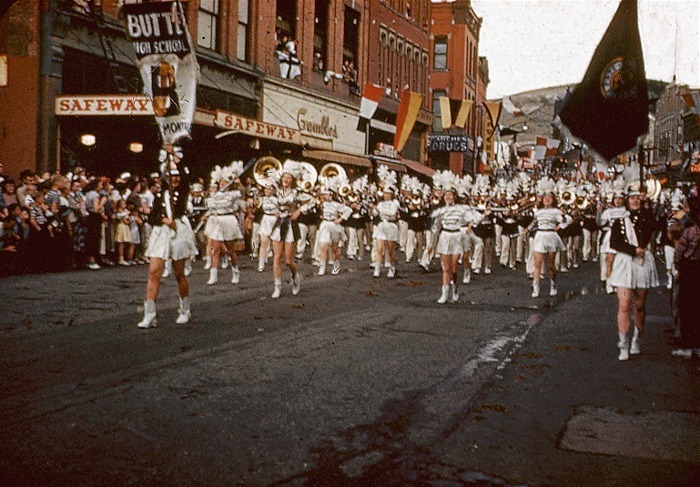 Many Helena businesses sported these during the Centennial year of 1964. 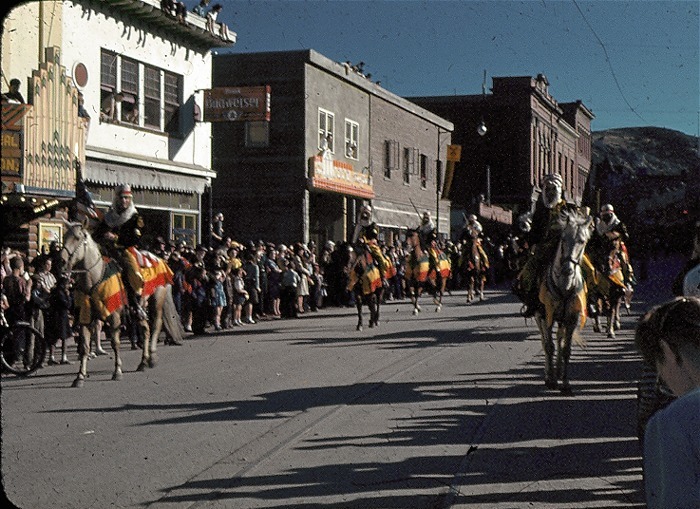 This had previously been done in 1949, during "Golden Canyon Days"..
On the far right is the 1934 Rio/Vigilante Theater building, still standing today. Buildings shown, from left to right: 335, 333, 331 and 327 North Main (Last Chance Gulch).